Former Manchester United midfielder Park Ji-Sung has retired from football at the age of 33. The South Korean, signed from PSV Eindhoven by Sir Alex Ferguson in 2005, won four league titles at United. Park, who finished his career back at PSV on loan from Queens Park Rangers, said knee issues meant he could no longer play at the highest level. "I'm leaving with no regrets," said Park - the first Asian player to play in a Champions League final. Park's energy and stamina meant he was often used by Ferguson in key fixtures during a seven-year stay at United. After joining for £4m, he became the first Asian to captain the club when he took the armband from Ryan Giggs during a Champions League fixture in 2005. He was unable to help United beat Barcelona in the final of the competition in 2009, but formed part of the Champions League winning squad a year earlier. "I enjoyed playing football," added Park, who played 100 times for South Korea and scored at three World Cups. "I have achieved more than I thought I would. I'm truly grateful for all the support I have received and I will live the rest of my life thinking how I can pay it back." 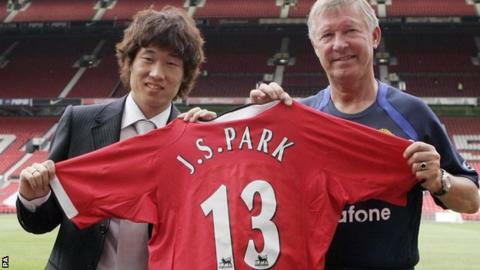 Park scored 27 goals in 205 appearances and won 11 trophies at United before joining QPR in 2012. He moved back to Dutch side PSV on loan for the 2013-14 season after Rangers were relegated from the Premier League.